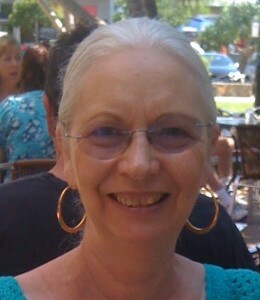 Australian author Maggie Christensen joins me today. Congratulations on the release of Band of Gold, Maggie. Was there something in particular that inspired you to write this story? Thanks, Sandy. A number of years ago I heard a story of someone who placed his wedding ring on the table on Christmas morning. It stuck in my mind and when I started wondering what might happen afterwards. Anna and Marcus appeared and Anna’s story began to take shape. What did you find were the advantages and disadvantages of writing in first person and present tense? It wasn’t really a choice. Anna’s voice came to me as soon as I began to write. I think the advantage was that it was easy to see the story though her eyes, and I didn’t have to worry about changing POV. As I was writing, I really stepped into Anna’s shoes, and the present tense made it more immediate. I guess the disadvantage was that everything was from Anna’s perspective, so there was no opportunity to see events form anyone else’s point of view. I have to say that, although I don’t normally write first person present tense, I really enjoyed it. What did you like most about writing Band of Gold? I enjoyed my characters. The story flowed well for me, and I think I fell a little bit in love with Marcus. I particularly enjoyed using familiar settings. Manly Beach was the first beach I visited in Australia when I lived for several years in Sydney, and I now live close to beautiful Peregian Beach. Do you find your readers come from all age groups, or, because your books deal with mature-aged heroines, your readers tend to be in that age group? When I began writing about women in their prime (I love this phrase), I thought I was targeting older readers – baby boomers. However I’m finding that my readers do come from all age groups. I guess women experience marriage and career crises at all ages, so the situations my protagonists find themselves in are easy to relate to. Do you think there is an advantage to having background knowledge of two locations, i.e., Australia and Oregon in the US, and how helpful has this been in writing The Sand Dollar? Definitely! I would never have contemplated Oregon as a setting if I hadn’t spent time there, and I don’t expect I’d be writing about Australia if I didn’t live here. I find that when I write, it’s as if I’m actually in the setting. For example, my current work, The Dreamcatcher, is set in Oregon, and I spend my days there when I’m writing. What do you envisage writing in the future? I’m presently writing what will most likely be book 3 in my Oregon Coast series. It picks up Ellen from The Sand Dollar and tells her story. Book 2 stalled part way through so I plan to go back to that one, which tells the story of Rosa, also from The Sand Dollar, and set in the Sunshine Coast in Australia. Also, although I wrote Band of Gold as a stand-alone book, Anna’s sister Jan has started telling me her story too, so that book is also in the cards. Plus a few more ideas which are still in their infancy. I intend to keep writing books with mature protagonists, as these are the ones I can relate best to. That’s great, Maggie. I know what it’s like to have characters start to tell you their story. I’m sure a lot of people think writers are a bit cracked when we say we hear voices in our head, but our characters become like real people to us, don’t they. 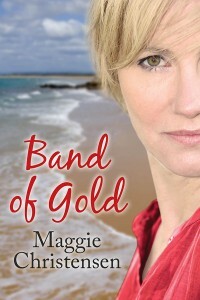 Band of Gold deals with the tricky topic of new romance after a failed marriage. 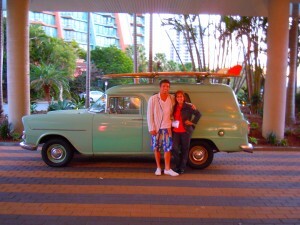 Anna Hollis is a forty-seven year old schoolteacher living in Sydney. She juggles her busy life with a daughter in the throes of first love, and increasingly demanding aging parents. Anna’s world collapses when her husband of twenty-five years leaves her on Christmas morning. She makes it through the family festivities, explaining his absence with a flimsy excuse, but later breaks down on a Sydney beach where a stranger comes to her aid. Marcus King has returned to Australia from the USA, leaving behind a broken marriage and a young son; through their mutual hurt and loneliness, a fragile friendship is formed when he takes up the position of Headmaster at Anna’s school. Written in first person, present tense the author slips the reader into Anna’s shoes as she struggles to leave the past behind and learns to trust again. Can Marcus be a part of her future? The band of gold, symbol of our twenty-five years of marriage lies on the table between us. I am stupefied, unable to speak. Tears prick my eyes as my first coffee of the day grows cold beside me. The sun is shining brightly through the kitchen window. The turkey is sitting on the kitchen bench waiting to be cooked. My parents, daughter, brother and sister, along with her husband and children are due to arrive in five hours’ time. The house is redolent with the scent of pine needles and Christmas pudding. It’s Christmas morning and my world has collapsed. ‘What do you mean?’ I finally utter, thinking this must be Sean’s idea of a bad joke. My mouth goes dry. My head begins to spin. The bottom has dropped out of my world. I look over at the man I have loved for over twenty-five years, his bushy greying blonde hair, his ruddy cleanshaven cheeks. He looks no different from any other morning. He’s wearing the bright yellow tee shirt we bought on our holiday in Bali last year. His steely blue eyes meet mine. This isn’t happening. ‘I can’t do this anymore, Anna.’ His waving arms take in the kitchen including me, ‘All this; family, house, job. I need to get away.’ He pushes his chair back from the table and strides out of the kitchen. I sit there in a daze, my mind going round in circles. Is it too late to call off Christmas lunch? How can I even think of such a thing? Does Sean mean he’s going to leave right now? How will I explain his absence? God, this is really going to be the Christmas from Hell. Thank you, Maggie, for being such a lovely guest. I look forward to seeing The Sand Dollar and The Dreamcatcher available in the near future.